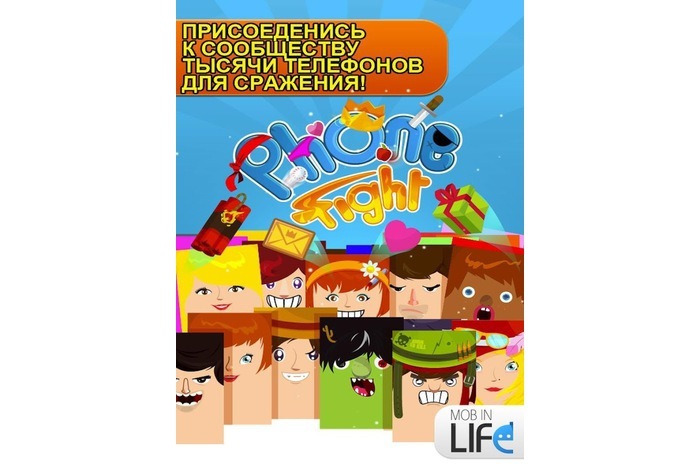 If you want to really play phone, and not on the phone, then install on your mobile Phone Fight game and show your skills phone management. The outcome of the battle depends only on phones dexterity of your fingers and the proper conduct of the game. This will be present, armed battles of our usual instruments, the arm can be anything that gets us to the eyes - from the toilet hedgehog or ladle, to high-powered laser blaster or a fantastic dragon. Now your phone will act as the main character and a real fighter. You will need to revive it, to create his unique guise, choosing from three billion variations, take care of it as a toy Tamagotchi, equip it with three hundred different weapons, to carry with him four missions possible, ninety nine levels. You can entertain your phone funny video, simultaneously winning free coins and play Lucky Bubble will give the chance to win not only a lot of prizes, but also a rare weapon. By training your phone and your skills by engaging in battle with the phones of friends and other fans of this game in multiplayer mode, you will hone skill and tactics of the game, while become consummate master. Game Phone Fight, which has a colorful, cool graphics, a variety of options of the game and the various types of battles, not that that will not bore you, and will never happen again. This is the first battle, the best in the world, a unique game in which you will be able to take full advantage of your cellphone and really play with it. Install the game and win a real priceless gift. - Battle of millions of phone in a crazy battle! - Create cool and unique image for your phone, 3000000000 variations! - Take care of him, feed him, play with him ... As with the Tamagotchi! - Challenge your friends, the people around and people from all over the world. In real time! - Play Lucky Bubble to win tons of prizes and rare weapons! - Watch funny videos to entertain your phone and win free coins! - Improve your ability to use your phone to become a Master!